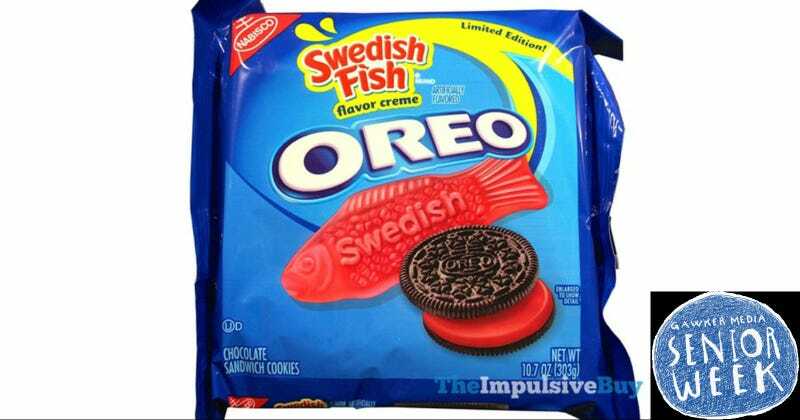 Bring Me These Swedish Fish Oreos, Okay? Gawker Media had a party last night and I’m very tired now. It’s hot as hell and blogging is hard and I just want these terrible-sounding Swedish fish Oreos. I like things that are bad and that’s just who I am, all right? I’m not in the office right now—it’s unclear if I’ll make it to the office today, to be perfectly honest with you— but bring me these godawful-sounding, trash, chemical-laden cookies and I’ll give you a tour or something. Maybe I’ll rain-check you on the tour, but, you know, it’ll totally happen. Yeah. Whatever. Bring me these Oreos, which are, for very good reasons, only available for a limited time. I would also accept a burrito.